4 tbsp of sunflower oil. This rotisserie chicken is served with chard for a tasty twist that makes it perfect for any family roast. Coat the chicken with the sunflower oil. This will help the rub to stick to the meat. Combine all the rub ingredients in a bowl and mix together well. Evenly coat each chicken with the rub mix. Carefully impale the chicken onto the spit, making sure that the spike is inserted firmly into the meat. Repeat this process with the second chicken. Attach the second spike firmly before screwing tightly in position. Wash the chard and separate the leaf from the stalk. Chop the stalks into small pieces. These can also be eaten but may require slightly longer cooking. Set up your barbecue for a medium indirect heat of around 200°C. Place a Weber® Drip Tray under the meat to capture the juices. These can be used to make gravy at a later stage. Place your Weber® Rotisserie on the barbecue. Remember, you will need a power supply to operate the rotisserie. Cook the chicken with the lid down for around 1 hour and 20 minutes, or until the core meat temperature is 75°C. 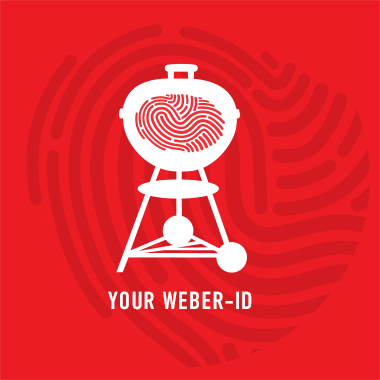 This can be ascertained using a Weber® Original™ Wireless Digital Thermometer. Allow the meat to rest for 10 to 15 minutes before carving and serving. While the chicken is resting, cook the chard. In a preheated Weber® Original™ GBS® Wok or heavy based pan, add a little olive oil, followed by the stalks of the Swiss chard. Sauté these for two minutes until they have slightly softened. Next, add the leaves. These will steam and wilt down, so don’t worry if your wok or dish is very full. Toss the leaves so the heat is evenly distributed, allowing the chard to cook down for 4 to 5 minutes. Finish with a good drizzle of extra virgin olive oil, along with the juice of one lemon and a pinch of sea salt. Why not try Tom & Henry Herbert's recipe for Almond Crust Roast Potatoes.